Protecting Biodiversity-There's an app for that. 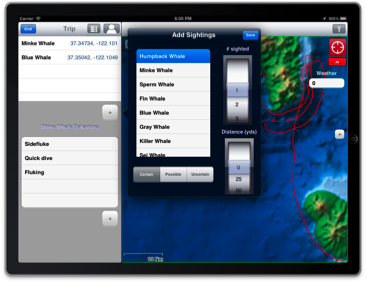 Developing simple, easy to use mobile apps that leverage the intuitive user interfaces gather information for conservation is another way I see myself as a catalyst for ocean conservation. Most recently I worked on an effort to enable the shipping industry to easily receive notification of right whale management measures in real time greatly reducing the risk of lethal ship-whale collisions. This project, known as WhaleAlert, took stakeholder outreach from easily overlooked placards to an interactive tool impossible to ignore. As a co-founder of Conserve.IO, I'm now working to connect the many sightings networks around the world for a truly awesome way to involve anyone in conservation of marine species. Check back here soon and in the meantime visit Conserve.IO for more information.